Many people go hours without eating which compromises your focus and metabolism. It’s often unconscious, until your stomach is an empty pit or your mind is mush. The same is true for many children and teens, especially during the school day. Four hours or more without food is far too long, in fact it depletes their focus and impacts their mood. In order to keep your child sharp and feeling successful during the school day, snacking is super important. Sure, some schools have “rules” about snacks and eating during the school day. A simple note to the teacher or nurse and you avoid that excuse. A backpack snack doesn’t have to be a meal, it’s a simple way to keep their mood at stable before lunch or dinner. There is so much research that supports eating snacks. You must eat to maintain focus, control blood sugar and to support your metabolism. It’s advisable to consume 4-6 portion-controlled, balanced meals every 3-4 hours throughout the day. My Body Tutor (a great site to check out) uses this great analogy: If you have a campfire burning and you don’t add wood to the fire, eventually the campfire will burn out! But if you add a little wood every few hours, the campfire will continue to burn. And burn hot!!! I’ve been hearing from more and more kids that they aren’t eating breakfast because they are simply “not hungry.” This is so important, your child must eat something (and you too) before they head out the door. If it’s not your typical breakfast, no problem, snacks are okay(my personal favorite is cheese and crackers). 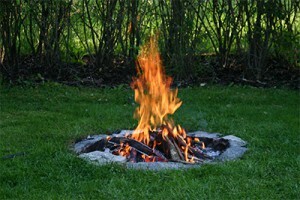 You and your child need something substantial to get the fire started, AKA your focus and metabolism need to heat up. Make it a snacking adventure if you have to. A bar, a smoothie, PB&J, trail mix even a few bites is better than nothing at all. Without this fuel your kiddo’s tummy will be grumbling in a few hours and it’s likely that your child’s grades will suffer around that time too. The picture above is Laughing Cow Cheese on toast! Which sounds like a great snack to me! Be sure to pack a snack and make breakfast contain protein, carbohydrate and healthy fat. This ratio is imperative for cognitive functioning and keeping moods stable. Many prepackaged and portable foods contain additives, dyes and more crummy ingredients than you can count. Try these for simple and effective alternatives for snacks that provide fuel for your child’s focus. 1. Bars don’t have to be boring. I wouldn’t suggest this as a meal replacement however, some of these tasty bars are perfect for mid day munching or after school energy. Chia Bars and LARA bars generally contain no nuts so the school can chill out about this one. KIND Bars tend to also be almond friendly and peanuts are rare. My favorite snack in bar form is the Almond and Coconut which contains: Almonds, Coconut, honey, non GMO glucose, crisp rice, chicory root fiber and soy lecithin. 2. Cheese. Not all cheese has to be refrigerated, and some varieties are actually better at room temperature. Laughing Cow cheese are awesome. Add to bread or a bagel, rather than cream cheese, spread on some crackers and you are fueled up for hours. Plus they are low calorie options for protein and calcium. 3. Chips and Nut Butter. Gluten and dairy-free rice crackers, chips, or NutThins and a side of almond or sunflower butter keeps protein and fat contents proportional, while also adding some complex carbohydrates. 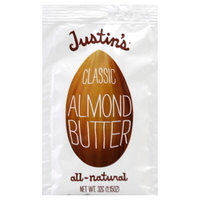 Justin’s Almond Butter is a product that has individual packs, or you can simply separate the chips and the nut butter into different containers to keep the chips from getting soggy. Many schools are anti-peanuts these days, so alternative nut-butters are an added bonus. 4. Trail Mix. Make your own by adding in nuts and cereals that your child likes, as well as some dried fruit or dye-free chocolate bites and you now have a portable healthy snack that is great for any time of the day. Have your kids make their own too, with this reindeer mix. My favorite gluten free and protein filled option; lentil chips, pistachios (without the shell), and dried cranberries (sugar-free). Good fats, protein, and complex carbs. 5. Edamame. This soy bean can be steamed and stored in any container, add some sea salt and it’s a protein powerhouse. There are roasted versions too, that are easy to snack on and nonperishable. 6. Jerky. Forget good old beef jerk, salmon jerky, soy jerky, and even turkey jerky can all be found with organic labels these days, and they are a great snack to tide hunger over in any kid. The protein content is high, and so is the sodium so watch out, but jerky has a great chewiness factor to keep kids occupied. 7. Popcorn and nutritional yeast. Nutritional yeast contains protein and vitamins and minerals including many B vitamins. 8. Chia seeds. Afraid of nuts? No problem, add some chia seeds to a bar or make your own at home. 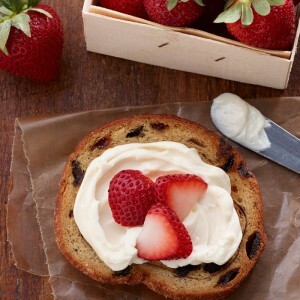 Here’s a great recipe by the Wellness Mama. 9. Roll Ups. Whole wheat or rice tortillas (gluten free tortillas if needed), Swiss cheese, and turkey slices, and add some avocado if your kiddo is an adventurous eater or mustard. Vegetarian kiddo’s, can try hummus and extra vegetables. Or the old-school PB&J can be jazzed up with almond butter, banana, coconut flakes and honey in a tortilla. Cut into pinwheels and they become more fun to eat. Make sure to keep those tummies feeling fueled and focused (yours too). What are your easy snack ideas? Share with us below!